In the table, several solutions are given. Enter the initial solution, to obtain the pH of the mixture. Click on the button “pH =”, to obtain the final pH. The calculated pH corresponds to the solution, that has been obtained by mixing the solutions selected from the table. and enter the values of concentration, volume and pK. Titration curves allows to trace the pH curve of an aqueous mixture. Let’s do an example. We wish to titrate a 0.1 mol/L solution of CH3COOH. The selected titrant is a strong base. Volume of Analyte is equal to 10 mL. Titration will stop when Titrant Volume will be equal to 20 mL. 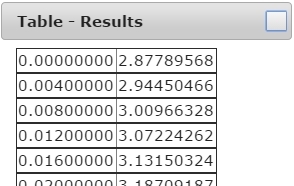 and the spreadsheet with the pH/volume values appears simultaneously. The present web app generates a two-column spreadsheet. The first one is the Titrant Volume. The second one is the calculated pH during titration. Such a speadsheet can be imported into another program, such as Microsoft Excel. 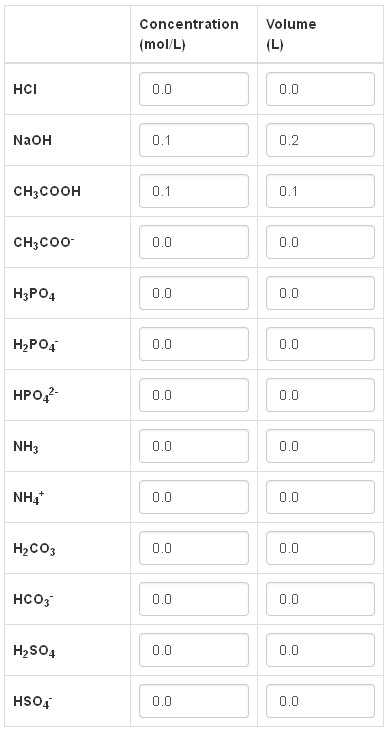 In order to trace the curve of an acid (or of a base), that is not given in the table, one has to click on the button “Add”. and enter values for concentration and pK. Here the curve obtained with 0.1 mol/L NaOH, for an added volume of NaOH 4 times larger than the volume of the analyte solution. Notice that for a base, acidic pK a have to entered. Here the titration of 0.05 mol/L Na2CO3 done with 0.5 mol/L HCl. © Copyright 2014, Paolo Galletto.